That feeling when you’re in the coupe. 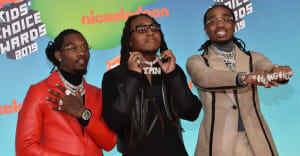 Migos recently shared "Say Sum", the first single from their upcoming No Label 3 mixtape, The song sounds radio-friendly, while maintaining Migos signature sound. Today, Quality Control released another single from the tape and the sound is similar - Quavo's hooks grab your attention without being repetitive, and the Cheese Beatz production lends perfectly to the trio's melodic sensibilities. There's also a great Sonic the Hedgehog reference. Listen to "Cocoon" below.